The Myanmar Timber Enterprise (MTE) offered for sale around 7,000 tons of teak logs and baulks of various hardwoods on 26 September. Some of the lots were in Yangon but most are outside of the city. 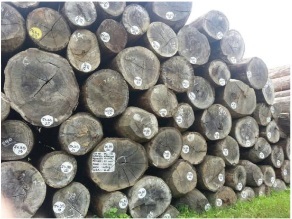 The Forest Products Joint Venture Corporation (FJV) offered 2,051 hoppus tons of kanyin logs for sale by competitive bidding on 24 September but only 492 tons were sold. The total income from the sale was MMK 211.285 million (approximately US$435 per hoppus ton). Observers report that the logs were reasonably fresh as they were harvested within this fiscal year. The tender reserve price is thought to have been around MM K425,000 per h. ton. Considering the August FJV open tender resulted in an average of US$537 per hoppus ton, the average price in the September tender was disappointing. Analysts suggest that, if the reserve price had been revealed, it is likely that more would have been sold. In contrast to the FJV system, at MTE open tenders MTE advise prospective buyers of the reserve price. The photograph gives an indication of the size and quality of kanyin sold by FJV on 24 September. A senior official from the Forest Department has indicated that the annual harvest for 2014 -15 would be only 40% of the harvest level in 2010-11. This fiscal year only 670,000 tons of hardwoods and 60,000 tons of teak will be available for extraction. Extraction in Homalin (Sagaing) and Tanintharyi areas will be reduced and Bago area will be totally stopped. According to a spokesperson from the Timber Merchants Association (TMA), there are about 300 wood processing factories in Yangon. Seventy TMA member companies and 10 rattan factories are exporting to Europe, USA, and Australia. Teak, length 6 ft. and up 27 mil. Teak, length less than 10 ft. 23 mil. Pylnkado. Length 10 ft. and up 17 mil. Pylnkado. Length less than 10 ft. 12 mil. Others, Length 10 ft. and up 0,7 mil.